The barn, the Lake Zurich’s Park and Recreation’s main building, provides us with a perfect example of the ease of dividing a room to create much-needed classrooms. The building houses a large room for classes and activities, with several offices off to the side and rooms in the basement. The cathedral ceiling creates a breathtaking facility however everything branches off from the one room, including the sound. To best use their space, a Screenflex portable wall is used to create a temporary classroom for Safety Town and other classes. 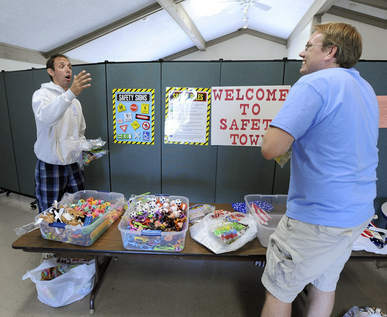 Pictured above is one Standard room divider that works to separate the Safety Town class while Lake Zurich Park and Recreation staff set up for the 4th of July festivities. The Lake Zurich’s Park and Recreation Department provides a wonderful Safety Town program for all kids going into kindergarten or first-grade ages 5 and 6 at the Barn. Receive instruction in pedestrian, scooter and motorist safety, fire safety, stranger danger, and poisons in the home. The children practice safety rules on an outdoor child-size replica of a town. Children attend daily classes for two weeks to reinforce instruction through a daily practical application. The children are also visited by members of the Lake Zurich Police Department and pay a visit to the Lake Zurich Fire Department. My son took this Safety Town class a couple of years ago and absolutely loved it! Instructors meet in the classroom but most of the activities are held outdoors. I noticed that the divider helped to keep the class contained as parents dropped off and picked up. What’s nice, is that people walking into the building could go to the offices without feeling like they were interrupting the class. Lake Zurich residents are looking forward to 4th of July festivities at Paulus Park next week, and the Village of Lake Zurich has been hard at work preparing for the big fireworks show and holiday for next Wednesday. Kids games and inflatable carnival rides will keep kids busy from noon until 4 p.m. Three bands will play from 11:30 a.m. until 9:00 p.m. Don’t miss this fun event!